Waiting for it to cool...! Although we live in a fairly isolated hamlet, Bread Man stops by every day except Sunday and we also have another one that comes three times a week. No problems getting hold of that staple carbohydrate for us. However, I enjoy making bread, and don´t always fancy the same type every day, so we restrict our deliveries to three times a week and then I make whatever takes our fancy. This recipe is one that I generally mix up in the bread maker, but cook in the oven. I do this because I prefer the more rustic shaped loaves I get when I finish them off myself, and because I can cook them with a pan of boiling water at the bottom of the oven to give them a great crust. This dough can also be made without a bread maker as I used to use this recipe before I bought one. I made the bread using the all in one method i.e. put all the ingredients into a bowl and mix by hand until they come together, then knead for at least 15 minutes until the dough starts to become silky, leave to rise in a lightly oiled bowl and covered with a floured tea towel. Leave to double in size, knock back, knead again, leave to rise and then a final knock back and shape into your loaf then leave to rise a final time. Whichever method you use, put your loaf onto a floured surface which you will be able to use to slide the bread into the oven and onto a heated baking sheet. I have some flexible chopping boards which work fantastically for this. When you have shaped your loaf, cut a few slashes in the top and sprinkle the surface with flour. Heat the oven to 180 degrees Celsius and put your baking tray inside. Heat a kettle or saucepan of water and when you are ready to cook, place a deep tin at the bottom of the oven and fill with hot water. Slide your loaf onto the baking tray and cook for about 45 minutes. Exact timings will depend on your oven, but it should sound hollow when tapped on the bottom. Remove from the oven and allow to cool – try to resist cutting into it while it´s still hot, or you´ll end up with lots of crumbs and slices of bread with holes in them! What a lovely looking loaf of bread. I have just started my hand at making bread and will be posting a few recipes from tomorrow. Well done on inserting a link into your post. Thanks Mandy – I think I´ve got a super keen firewall or virus thingy (or something) as my links just don´t look quite like anyone else´s! Thanks for the adivce though, it worked, just not quite as attractively as I´d hoped. Oh well, Rome wasn´t built in a day….Looking forward to seeing your recipes this week. That looks amazing. Even though I too like making my own bread, the idea of having a bread man stop by is just fantastic. The Bread Man is great – it´s a little lifeline for lots of people round here, especially the old folk as he´ll pass on the news and ferry things around too! Who needs the internet when you´ve got a Bread Man!! This looks wonderful. So it’s okay to use a breadmaker? Mi tía vive en Mairena del Alcor. Hi Georgette and thanks for stopping by my blog. Yes, using a bread machine to do the hard work is ok in my book! 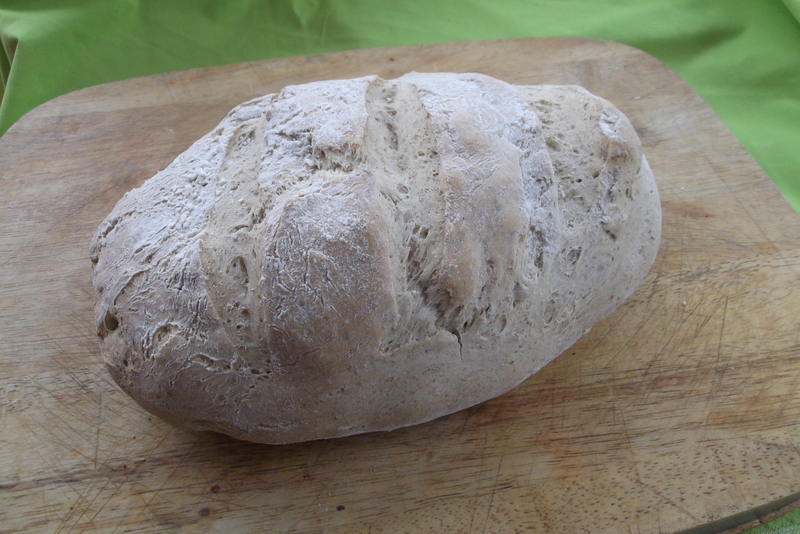 I tend to using it mainly for the kneading and not so much for the baking, but that has it´´s place too. Mairena del Alcor – near Sevilla right? We´re about 2 hours from Sevilla, but go quite often as we love it (just not in July or August if we can avoid it as it´s soooo hot then!). Have just popped over to your blog and it looks great, will be going back for more soon. Watch this space as I´m going to put up some very Andaluz gazpacho recipes soon…..
I’m way late to this, just made a couple loaves using this recipe and they turned out really well. They Are a bit more gluten-y then I like and I’m assuming that’s because of the bread flour. Do you think this would be Successful using all purpose flour? Would I need to make any adjustments? I’m not sure as I’ve always used strong flour which has a higher gluten content. I’d say, just go for it, maybe make a small loaf…what can you lose apart from the price of a small amount of flour and a little time!